Martin, R. A. (2007). 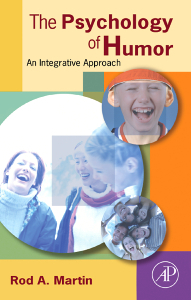 The psychology of humor: An integrative approach. Burlington, MA: Elsevier Academic Press. Bressler, E. R., Martin, R. A., & Balshine, S. (2006). Production and appreciation of humor as sexually selected traits. Evolution and Human Behavior, 27, 121-130. Martin, R. A. (2006). Humor. In N. J. Salkind (Ed. ), The encyclopedia of human development (Vol. 2, pp. 659-660). Thousand Oaks, CA: Sage Publications. Yip, J. A., & Martin, R. A. (2006). Sense of humor, emotional intelligence, and social competence. Journal of Research in Personality, 40, 1202-1208. Kazarian, S. S., & Martin, R. A. (2004). Humor styles, personality, and well-being among Lebanese university students. European Journal of Personality, 18, 209-219. Martin, R. A. (2004). Sense of humor and physical health: Theoretical issues, recent findings, and future directions. Humor: International Journal of Humor Research, 17, 1-19. Martin, R. A. (2003). Sense of humor. In S. J. Lopez & C. R. Snyder (Eds. ), Positive psychological assessment: A handbook of models and measures (pp. 313-326). Washington, DC: American Psychological Association. Martin, R. A. (2002). Is laughter the best medicine? : Humor, laughter, and physical health. Current Directions in Psychological Science, 11, 216-220. Martin, R.A., Puhlik-Doris, P., Larsen, G., Gray, J., & Weir, K. (2003). Individual differences in uses of humor and their relation to psychological well-being: Development of the Humor Styles Questionnaire. Journal of Research in Personality, 37, 48-75. Martin, R. A. (2001). Humor, laughter and physical health: Methodological issues and research findings. Psychological Bulletin, 127, 504-519. Martin, R. A. (2000). Humor. IN A. E. Kazdin (Ed. ), Encyclopedia of Psychology (Vol. 4, pp. 202-204). Washington, DC: American Psychological Association. Martin, R. A., & Kuiper, N. A. (1999). Daily occurrence of laughter: Relationship with age, gender, and Type A personality. Humor: International Journal of Humor Research , 12 , 355-384. Martin, R. A. (1998). Approaches to the sense of humor: A historical review. In W. Ruch (Ed. ), The sense of humor: Explorations of a personality characteristic , pp. 15-60. Berlin: Mouton de Gruyter. Martin, R. A. (1996). The Situational Humor Response Questionnaire (SHRQ) and Coping Humor Scale (CHS): A decade of research findings. Humor: International Journal of Humor Research, 9 , 251-272. Martin, R. A. (1989). Techniques for data acquisition and analysis in field investigations of stress. In R. W. J. Neufeld (Ed. ), Advances in the investigation of psychological stress , pp. 195-234. New York: Wiley. Lefcourt, H. M., & Martin, R. A. (1986). Humor and life stress: Antidote to adversity . New York: Springer/Verlag. Martin, R. A., Kuiper, N. A., Olinger, L. J., & Dance, K. A. (1993). Humor, coping with stress, self-concept, and psychological well-being. Humor: International Journal of Humor Research, 6 , 89-104. In general terms, my research interests have to do with the relationship between psychosocial stress and both physical and psychological health, and with personality variables and coping strategies that moderate this relationship. In recent years, my main research focus has been on the psychology of humour. One line of research has to do with the conceptualization and measurement of sense of humour as a personality trait, and the ways in which it relates to other personality dimensions. A related topic of research interest has to do with ways in which humour and laughter may serve as mechanisms for regulating affect or coping with stress, and their impact on mental and physical health. In this regard, I am interested also in distinguishing individual styles of humour that may be adaptive and conducive to mental and physical health from other styles of humour that may be maladaptive and health impairing.